MCM Training – Week 10 Long Run, Part 2 (10.44 miles – Applause!) | So What? I run. What can I say? Another beautiful morning and another fantastic run! I cherish these runs and embrace them because I know the next run might not be so great. After the past couple weeks, I really needed a weekend like this and I truly feel blessed to have been given it. I was actually very emotional when I told my husband how I wish he could experience feeling so good. He has serious back problems and is in pain all the time and I would give him a years worth of excellent runs for him to feel this way just for a moment. Everyone deserves to feel this good. What made this run extra special was the fact that the Six Pack was together again! We didn’t run together the entire time as I met them part way through the run (they were going for 17), but the moments we were together were special. The best part was stuffing our faces with brunch and Bloody Mary’s at McFaul’s in Loch Raven. Here’s a recap of today’s stats. Even though these numbers are slower than yesterday’s run, this is right were I need to be for training. Today’s run is another run that deserves a theme song and today that would be Applause! by Lady Gaga. Because when I run, I do hear all of you encouraging me and cheering me on. I look forward to the big race when it will feel like the entire world is out there just for us. Next run, Track workout. Next long run…20 MILES!!!! This entry was posted in Marathon Training, Songs for Playlist and tagged long runs, Marathon Running, mcm marathon, MCM Training, Running, sole sisters, Sports by SoWhatIRun. Bookmark the permalink. Great job! Those long runs are tough, but you’ve got this! 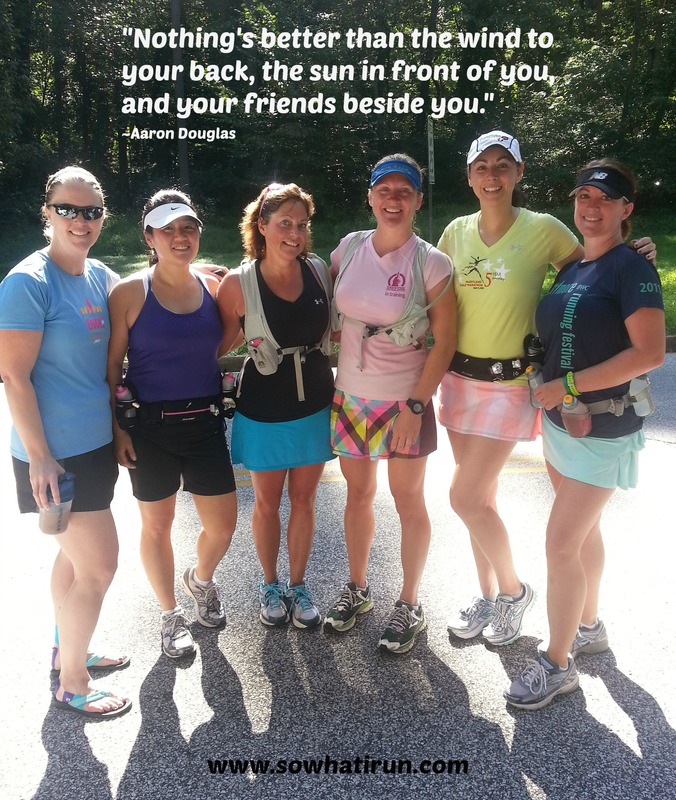 I had my longest run ever this weekend, 16 miles and it went great…..getting closer to MCM!! Thanks Sue! 16 miles – That’s awesome! Isn’t this the best part of training??? Yay us!! You go girl! Love the blog! Keep up the fantastic work!